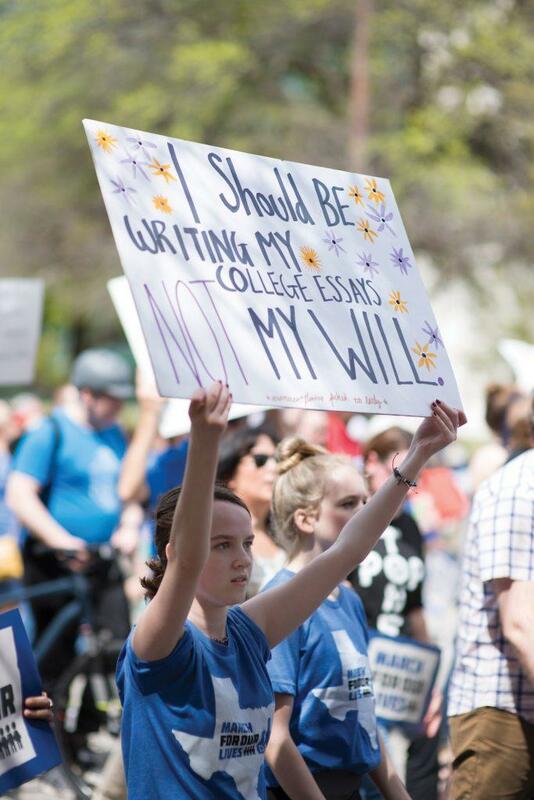 Photo by Jacqueline Arredondo | Kate Collins, a senior at Yvonne A. Ewell Townview Magnet Center, holds a white homemade sign at the March For Our Lives rally in downtown Dallas March 24. Dallas-area students joined thousands of others across the nation to take a stance for gun control in the nationwide March For Our Lives rally. The student-led demonstration was a response to the Feb. 14 shooting at Marjory Stoneman Douglas High School in Parkland, Florida, where 17 students and staff were killed. Dallas Police Department officials estimated between 4,000-5,000 people attended the march downtown with no arrests or incidents, according to CBS DFW. More than 800 sibling events were held across the U.S. and the world, according to the Dallas Observer. 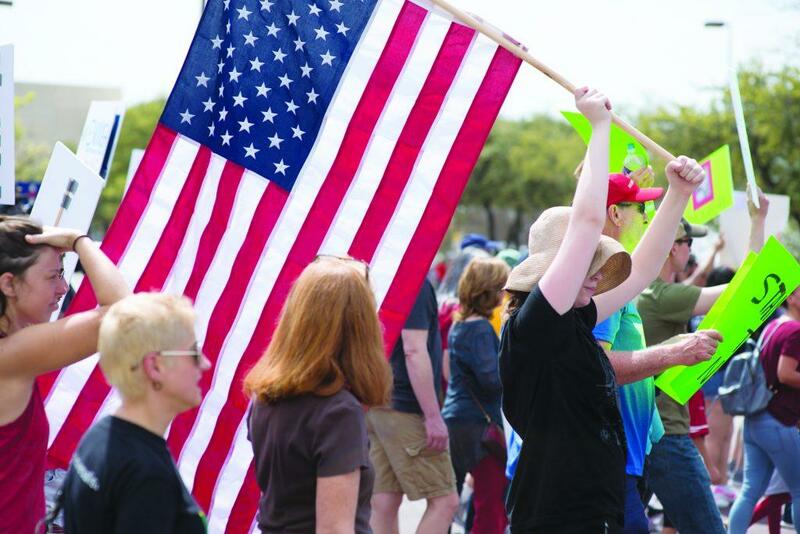 Arredondo | A group of protesters stroll through the streets of Dallas March 24. 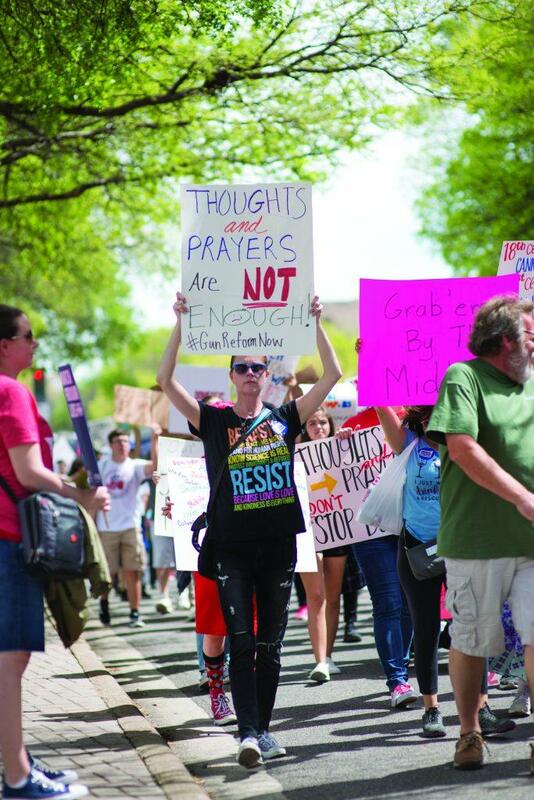 Justin Irwin, a survivor of the Parkland shooting, marched in Dallas to show his support for gun legislation, according to the Observer. “My goal for these marches is that this never happens again,” Irwin said. Led by the student organizing committee, StudentsMarch.org, the protesters invaded Dallas’ downtown streets. Leah Renee, a Brookhaven College student, attended the march with her sons. She said she believes educating her children on gun violence is necessary, but dreads the possibility of her children living in fear and paranoia. Renee said she worries every morning when she drops her children off at school. 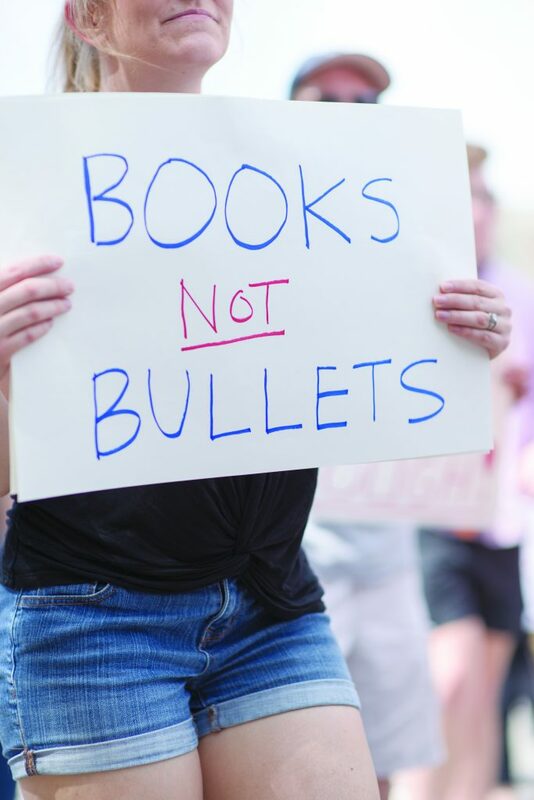 Arredondo | Sarah Duffy, a protester, hoists a poster board advocating gun reform. The march began north of Dallas City Hall on Young Street and headed toward the Kay Bailey Hutchison Convention Center, where the National Rifle Association is set to host its 147th NRA Annual Meetings and Exhibits May 3-6, according to nraam.org. Shaunte Allen, a former Brookhaven student, community activist and teacher at Tyler Junior College, volunteered as a guardian during the event to advocate for her students’ safety. Guardians were the parents, teachers and mentors of the students in the march.They wore red and lined the march route to provide support and encouragement to the students. “I can’t be one of those teachers who believe it won’t happen to her school,” Allen said. A small group of counterprotesters were also in attendance near the end of the march route. Using a speakerphone, David Grisham, a pastor, spoke religion-based, anti-abortion rhetoric to the crowd in hopes to sway protesters away from the firearm controversy. Grisham said the public should promote pro-life advocacy and implement Christian ideology in public schools, as opposed to protesting assault rifles. Arredondo | An attendee displays a sign at the rally. After the crowd gathered again at City Hall Plaza, speakers engaged the crowd, calling for Dallasites to take political action against assault rifles and funding for the NRA. Volunteers walked and weaved through the crowd with voter registration forms, eager to take the fight from the streets to the polls in the upcoming November midterm elections. This entry was posted in Campus News by The Courier. Bookmark the permalink. Readers may contact the Courier by phone at 972-860-4787 or by email at bhccourier@dcccd.edu. Copyright © 2019 The Brookhaven Courier. All Rights Reserved.